The Thanksgiving Fundraiser Ideas below will help your church raise money for different funds and at the same time bring church people together on a very important Thanksgiving holiday that is all about being thankful for everything in your life. Why is Thanksgiving a great time for your next fundraising events? Because Thanksgiving is one of the busiest and most usually over-planned holidays of the fall season. As everyone is anticipating a long weekend of feasting, family and fun, mugs of hot apple cider, curling up and warming by the fire with cozy sweaters or blankets on the couch with a heart warming movie with family and friends. Thanksgiving Dinner Fundraiser - Gather volunteers to have a Thanksgiving Dinner as a church fundraiser. Use the flyer below to spread the word to church members and their families, etc. 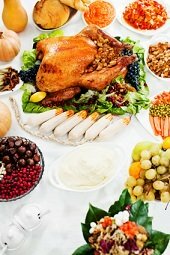 to enjoy a great Thanksgiving Dinner and all the fixings before Thanksgiving Day. You can have the dinner the week before, 2 weeks before or during Thanksgiving. Charge so much a person and raise money for your church, etc. Canned Food Drive - When you begin and start planning your family feast for Thanksgiving, request that each family member and friend bring a nonperishable can of food to the traditional Thanksgiving Dinner. You can collect these cans of food as a family group or church group and donate them to your local food bank or families in need. Thanksgiving Walk Fundraiser - There is nothing better than a walk to get the blood flowing and to help digest that turkey and dressing and enormous amounts of desserts after the Thanksgiving Feast. Gather volunteers and pledges for this walk during the weeks before Thanksgiving asking people to donate a few dollars a mile. You are only going to fall asleep on the couch if you don't get and get moving anyway so donate your money, time and energy for a great cause. Return to Thanksgiving Flyers & More from Thanksgiving Fundraiser Events.